When I got married in 1992, aside of exceptional husband (yes, I am saying this after all those years), I also gained 2 fantastic step-daughters. Recently, when my husband had a surgery, one of our daughters (Janine) gave him flowers with the wishes for the speedy recovery, and gave me a bottle of Christine Andrew Cabernet Sauvignon. Supposedly, for all the trouble I had, taking care of dad. But he was the one being sick!!! Didn’t I say we had fantastic daughters??? She also jokingly added: “Wait for me to open it”. And I did. The truth is, we don’t drink a lot of Cabernet Sauvigon in our household anymore. It would require a good steak or burger dinner to enjoy it. And, honestly, that’s not on our menu very often. In the never ending effort to loose weight, we lately eat larger meal at noon (well, larger, about 1/2 of our normal portions), and a cup of soup in the evening. We try. So far it sort of works for us and I have lost some weight. Thankfully! So you can imagine that with a regime like that, there isn’t much space to enjoy a good, big Cab. 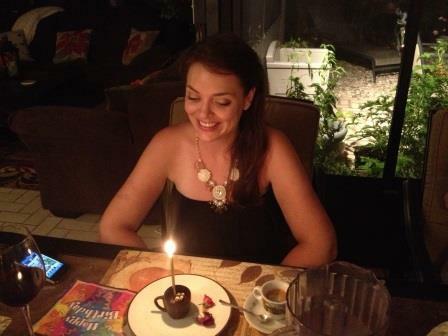 But there was a special occasion around the corner – Janine’s birthday. I have invited her and her husband for a birthday dinner and planned to open that bottle she gave me. Both of us never had it before, so it was a good way to try it out. The dinner was planned for just four of us. It would give her a chance to get away from her daily routine, taking care of their sweet child, away from stress – just to enjoy herself in the privacy of our home. Of course, she could have had a party, or a special dinner out with her hubby and friends, but she chose me. My little private “restaurant”. I was thrilled. 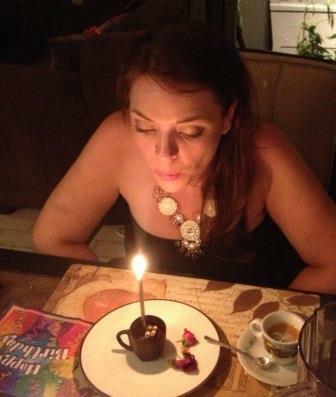 Therefore, I started to compose the “special birthday menu” around the wines, I was planning to open that evening. As we all like it spicy, I knew exactly what I am going to make. I usually like to start with some light and crisp white wine, but I knew that both Janine and her husband really enjoy reds more, so I skipped that. We will start with red wine and continue with even bigger reds…. We started the evening with mushrooms, stuffed with spicy Italian sausage, and roasted eggplant and peppers dip, spiced up with my own grown jalapeño pepper from the garden. The bottle of Christine Andrew Cabernet 2007 was already decanted. Well, the 2007 Christine Andrews Cabernet Sauvignon was nice, I must say. When I did my research, I found out that it was Kautz Family’s effort, a project that is a part of their Ironstone vineyards. The wine paired well with the appetizers, just as planned… It showed a nice, balanced dark fruit, velvety tannins, a little spice encouraged by the spicy food we had, and pleasantly long finish. A pretty wine. Then we moved on to a dining table, and continued with Clos de Los Siete – in my opinion some of the best bargains out there. Superb red, made by the group of winemakers in Argentina, who are led by famous French winemaker Michel Rolland. For that wine, I have prepared a real treat: slowly smothered steak tips in thick red wine sauce, seasoned with wild and shiitake mushrooms. 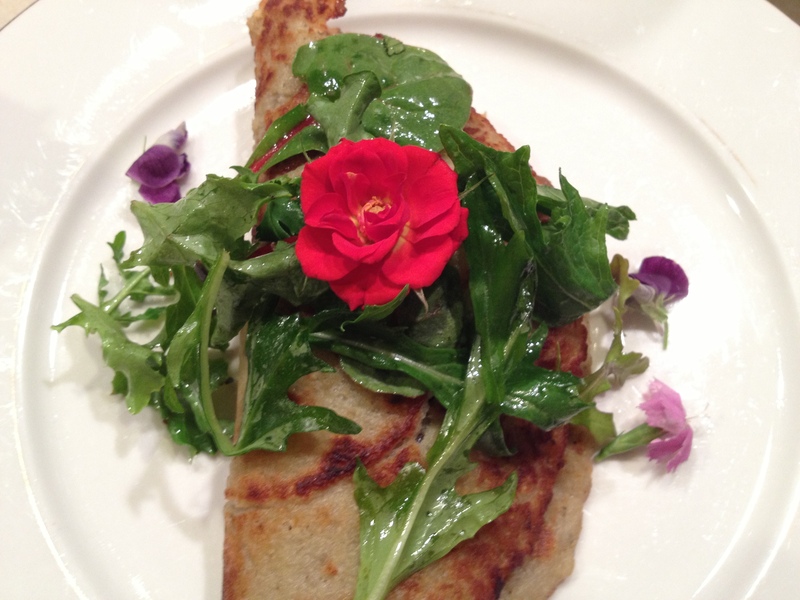 All that was wrapped in potato pancake and decorated with little arugula salad and eatable flowers on top. This really hit the bank! All four of us enjoyed it very much. 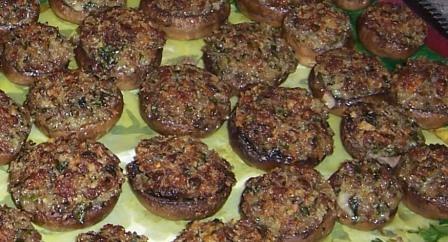 The wine paired fantastic with the deep, rich flavors of the beef and medley of mushrooms. Of course, it wouldn’t be a birthday dinner without a birthday cake. As passionate as I am about cooking, I must say that I am not big on baking. I do it when I must, but this time I imagined that I wanted something petite, very chocolaty (that Janine loves), and something cute for her. I found it at WholeFoods bakery – exactly what I imagined. A tiny little espresso cups made of chocolate, filled with fluffy, dark, chocolate mousse goodness. Yummy! My mouth is watering even when I write this. I so wanted to share this with you. Sometimes it isn’t just about the wine or food. Sometimes it is about the people you share it with. Although it was my step-daughter’s birthday, and I cooked, I felt like I was the one who got all the gifts. The most important ones. Gifts of love, happiness and a great family.